Log In or Sign Up to participate in chat. Looks like redemption problem has been fixed. Added all missing BlizzCon loots - look for them in Mounts, Pets, and Toys. @Effendx: Please make sure to fully read instructions your bank asks (if any) when you submit your information. when trying to pay with my visa, how do i fix ? @maximelapointe9: Please check your emails. @Targaryentv: Please check your emails. @killayoungin: You took great sceenshots for us, good times. @Neiara: Things are good here. In-game I have a lot of new content yet to see! @silesi: It is not straight forward. If the card is a foil type then it will work. @Zhorak: Nothing specific, cheapest sellers that ship loot cards worldwide. Hi, the ebay articles you link to, are they people you are affiliated with or just random posts that you have found? Does the Mists of Pandaria collection include the mount and the battle pet? How is it delivered? @pollodorado1: We got your "contact" through our system, please check your emails. i have bought a mount but when i want to redeem my code it says that its invalid, what can i do? hey Does anyone want 2004 World of Warcraft Collector's Edition (Sealed)? I'm sorry if this is stupid, but is it possible to sell loot cards we've found in booster packs? Or can we only buy here? @RCGator: that was one of mine...thank you! Enjoy the site as everything is provided to you by the best of the best sellers in the market. Just wanted to quickly say I bought a MoP collectors edition from you guys and received it with no issues! will look at buying tcg stuff from you next thanks!!! Hello, If i want to sell a wotlk ce to you guys how much do you offer? @hereza: Please let us know via our contact system, supply your region and realm you are trying to redeem to. Hello. I click on redeem button in my purchase history but when I click on redeem code on the the battle.net I get error "This code is not valid. Please verify your code and try again." Another problem we face is shown in this photo of duplicate Goblin Weather Machine loot codes. 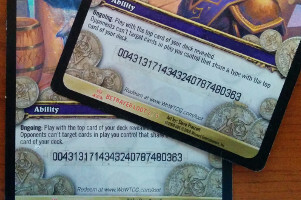 Blizzard / UDE / Cryptozoic had quality control problems when batches of codes were reprinted, usually when boutique products such as Epic Collections or foreign language were made. The vast majority of affected cards were common loot, but we think that is simply because common loot was printed in far greater numbers than the other rarer loot.